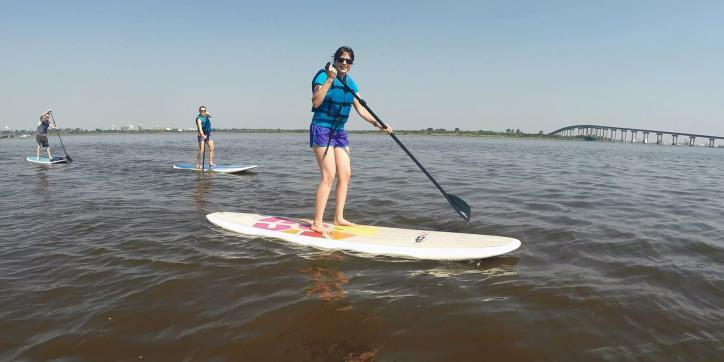 One of the great things about Lake Charles is there is no shortage of water activities. From boating and waterskiing to tubing and kayaking, the ways to enjoy our waterways are limitless and easily accessible.I decided to hit the water a few weekends ago via stand-up paddle boarding also known as “SUPing.” SUPing has grown in popularity over the past few years and I am a sucker for trends, so I gathered a crew of friends and contacted local SUP company, Paddle Up Boarding Co. to set up a group lesson. Owner/Instructor Shawn Garry met us at Prien Lake Park’s kayak launch and got us ready to launch. We all got fitted for our paddles (they are adjustable for each person’s height) and personal flotation devices (PFDs). Then Shawn gave us an introductory instruction on the sport and paddling area as well as a safety briefing. Once everyone was outfitted, we knelt on our boards and paddled around, getting acquainted with the stroke of the paddle and the sense of balancing on our board. And then came the real challenge-STANDING UP! After a quick assessment of my footing and core, I was up! 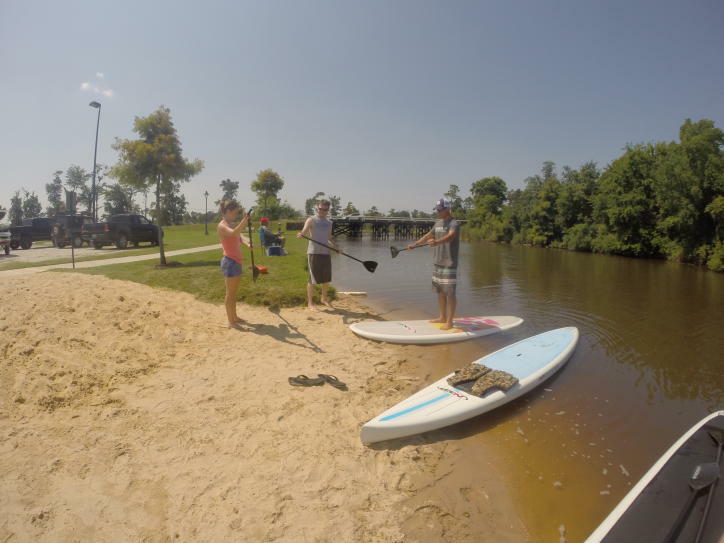 We paddled around Prien Lake and then back to Henderson Bayou. It was surprisingly easy. Bending my knees slightly with each stroke, I dipped my paddle into the water and pulled along the side of my board towards the back. Some strokes on the right, then over to the left and repeat, maintaining a straight-ish course. It was a workout but not difficult. The sound of the water splashing against the board, the warmth of a bright sun, and being out in nature made it relaxing. We had an absolute BLAST! If you haven’t tried SUPing put it on your “Must Do” list. And with summer heat in full swing, now is the perfect time to try out the new sport. 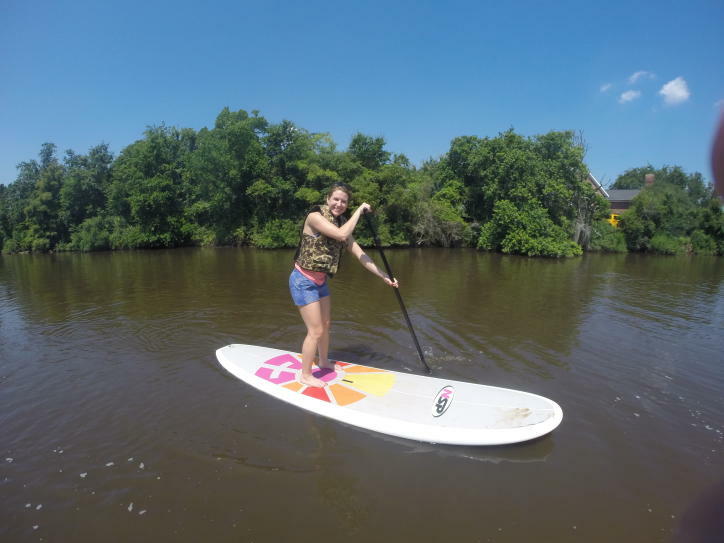 **JULY 2017 UPDATE** - You can also rent paddle boards from Lake City Board and Bike, LLC and Lloyd&apos;s Country Store. 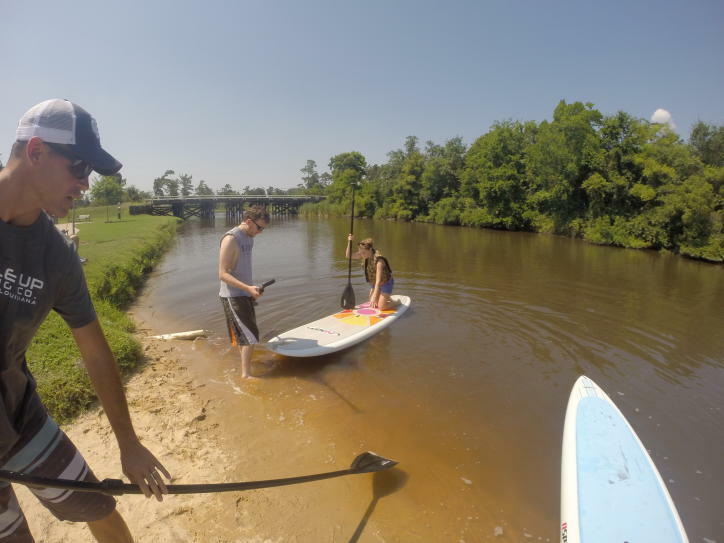 For more Outdoor Adventure ideas, visit http://www.visitlakecharles.org/things-to-do/itinerary-ideas/outdoor-adventure/.